Also making an appearance in Skyward Sword is Link's favorite bully and the lady who lives in his sword. Link, stalwart hero of the Legend of Zelda games, will finally get to spend some time with his girlfiend's dad in Skyward Sword - well, one of his girlfriends anyway, as there are actually about a dozen different Links and Zeldas at this point. 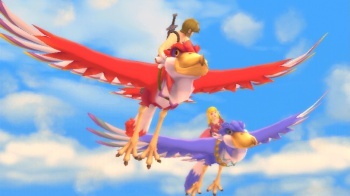 A partial cast list for the game has revealed a number of Skyloft's inhabitants - which is where Link is from in Skyward Sword - and as well as his father includes bullies and magical swords. Gaepora is Zelda's father, as well as the headmaster of the school that Link, Zelda, and Link's arch-nemesis Groose all attend. Also appearing in the game is Fi, who is the "spirit of the Goddess Sword," or in other words, the strange-looking lady on the game's box art. Various characters' family members have appeared in Legend of Zelda games before, but they've never been really central to the experience. Indeed, in A Link to the Past, Link's uncle seemingly dies about ten minutes in - sorry if that's spoiled anything for anyone - and is never mentioned again. As Nintendo seems intent of having players visit Skyloft pretty often, having Zelda's dad in the game could be really interesting. Admittedly, Nintendo isn't great at characterization, but this seems like it could be a step in the right direction.